The poker game 5 Card Draw is a fun, strategic game played with 2 to 6 players. 5 Card Draw is less about the cards you are dealt, and more about how you play them. Below is the video tutorial and explanation. Ante: Before the cards are dealt each player needs add an ante to the pot, such as 1 chip. The ante amount is determined before play begins. Deal: Each player is dealt 5 cards, 1 card at a time. Objective: The object of the game is to win chips. Chips are won by being the only player that did not fold, or by having the highest ranking poker hand among all the players that did not fold at the end of the hand. Game Play: The player left of the dealer is first to make a bet or can check. Check means the player is still in the hand without increasing the bet. Once a bet is made, calling check is no longer an option. Betting moves clockwise with players having to at least match any previous bets. A player can also raise the amount of a previous bet. If a player does not want to bet, the player can fold his/her cards, and be out for the round. A folding player sacrifices his/her ante. Players must match the highest amount bet to stay in the round. After the first round of betting, all remaining players get to discard unwanted cards from their hands. The dealer will deal each player the amount of cards he/she discarded. Another round of betting begins with players again having to at least bet as much as any previous bets. A player still has the option fold at this time. Once the betting round is over, all remaining players in the hand show their cards. The player with the highest ranking poker hand wins all the chips in the pot. The middle pot is split if players have equally ranked poker hands. An ace can be used as the highest card in a straight or the lowest card in a straight. If all players check in the first round of betting, the deal moves to the next player. Another ante is added by each player. When playing with 6 players, the most a player can discard is 3 cards. 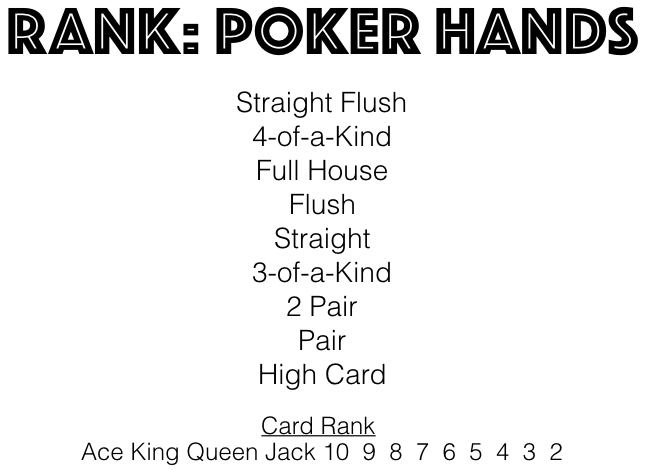 Some variations of the game have the rules that no player can bet unless he/she has a pair of jacks or higher, and the most a player can discard is 3 cards no matter how many players are playing.